With the winter weather arriving in Brisbane and it feeling a lot colder in the mornings, it gave me the wonderful opportunity to wear two of my newly purchased cardigans right away! I picked up these cardigans in the Jeanswest knitwear sale last month. I couldn't resist getting two of them! You might remember that I already have a little red cardigan. I decided to donate that one and replace it with this. It's thicker, warmer and with longer sleeves. I also I love the button feature! It's got a button on either side of the cardigan you can use to button up the hems. You can use it for breastfeeding, or to change the knit into a cowl neck top. Just wearing it simply here, letting the waterfall drape shine and the red pop against the black outfit. Cooler weather means long sleeves more regularly too! I'm so pleased to be able to get this star print shirt out again. It's one of those pieces that is formal enough for work with the buttons but casual enough for stay at home mum style with denim. I love how it looked with the pencil skirt. 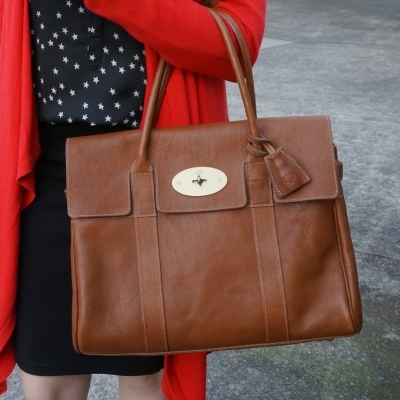 With the red cardigan being a big bright pop of colour with my outfit I went with a classic neutral tan for my accessories, with my Marc Jacobs ballet flats and Mulberry Bayswater bag. Sadly, this may be last time I wear this shirt. I stupidly didn't check the setting on the iron and burned literally right through it when I tried to go over it quickly. So annoyed with myself! I'm going to take it to my tailor and see if it can be turned into a tank after I burned right through one of the sleeves. Last worn: star print shirt, ponte pencil skirt, camel flats, Mulberry Bayswater. First time I've worn the cardigan as it's a recent purchase. Other ways to wear: star print shirt and burgundy pants, ponte pencil skirt, camel flats and sheath dress, Mulberry Bayswater and chambray dress. Perfect for pregnancy: star print shirt in first trimester, ponte pencil skirt in second trimester, camel ballet flats in second trimester, Mulberry Bayswater in third trimester. It was this navy cardigan I'd seen on the website that prompted my trip into Jeanswest. When I saw the red one above hanging next to it, I decided to take them both in to try on, to pick my favourite. I decided I liked them both enough to buy them! I think this navy will be the perfect neutral to add to my winter wardrobe. I like how it worked with the blacks in this outfit, and just as the red cardigan did above, it kept me cosy on my autumn morning commute to work. Last worn: navy cardigan, mixed print shirt, zip detail pencil skirt, Walnut Melbourne ballet flats, Mulberry Bayswater (above). 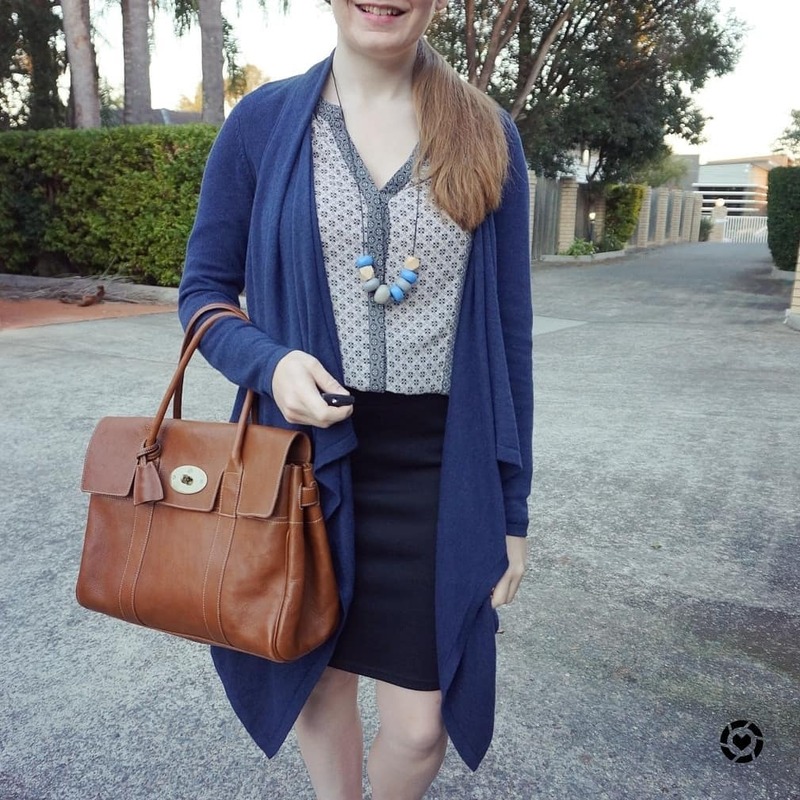 Other ways to wear: navy cardigan and printed shorts, mixed print shirt and shorts, pencil skirt for Youtube creator day, Walnut Melbourne ballet flats and a-line skirt, Mulberry Bayswater and polka dots. Perfect for pregnancy: zip detail pencil skirt in first trimester, Walnut Melbourne ballet flats in third trimester, Mulberry Bayswater in second trimester. With a neutral printed skirt and a black pencil skirt, you have an easy and professional outfit for work, especially when you add a classic bag like the Mulberry Bayswater. For a little fun and colour with your outfit, you can add a cardigan just as I have in these outfits here. If your workplace is more formal, just leave the cardigan in your bag when you get to your desk. Linking up with Confident Twosday, Trend Spin, Turning Heads, Style On The Daily, Fashion Frenzy, Oh Hey Girl, Fashion Files. Your Mulberry bag is so lovely! You can tell it's one of those pieces that keep looking good (or even better!) with time. I love pencil skirts! They just make me feel so classy! They look so sophisticated too. I love the pop of red in the first outfit, creates a statement. How smart to pick up both the cardigans since they will get so much wear. Especially that they have so much versatility with that button and making them look so different!! Hopefully you had a wonderful weekend, Mica!! We were able to go to the sidewalk chalk art festival and see so many great artists' work!! You are always looking polished and professional. That black and red combo is so striking and very flattering on you! Thank you! I think they look great together! Ooh I love how the red stands out against the black, and the gorgeous brown leather bag. That is such a bummer about that top--I'm crossing my fingers your tailor can make it into a tank! I was hoping she could, but she's retiring so I'm tailor-less again! Such cute outfits, I especially love the first one. Red looks so good on you, you should wear it more often! Happy Monday! It is such a cheerful colour to wear! I always end up wearing it more in winter! That Mulberry bag is gorgeous!! Yes it's so frustrating as I loved that shirt! Both looks are so chic, but I have always had a special place in my heart for the power trio of red, white, and black. So your first look really caught my eye. and I love your Cardigan. I absolutely love the scarlet red cardigan you got. Paired with a pencil skirt, it looks fantastic. I also really like the second cardigan, the second outfit is really nice as well. The bag is stunning. It matches both outfit perfectly. Great styling. Have a wonderful week ahead. Thanks Ivana :) I'm glad you liked both outfits! Love the pencil skirt! Such a chic look! 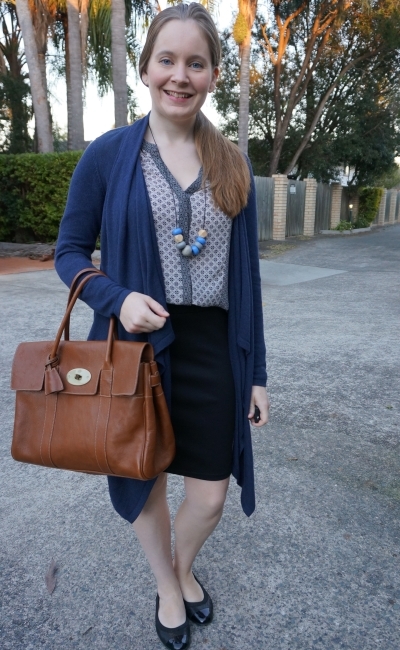 I adore waterfall cardigan, it just really dresses up a simple outfit and it's so versatile too. I used to be obsessed with Mulberry bags when I first started the blog. I think seeing your bag retriggered my obsession! Such a gorgeous bag! Cute outfit and love that handbag! Yes, happens to all of us at some point! Happy new week! I adore both looks and you layered beautifully with the cardi. That's a bummer about your shirt. I hope you can re purpose it. ..and the bag as always is fabulous. I was hoping I could change it and keep it - I'll need to find a new tailor though! Such fabulous work looks! Love that bag too! Totally loving the pop of color and they're great for the office, when you need to ward off the AC. I really like the length of your new cardigans on you! I've done that before with an iron only it was on the front of the shirt. No fixing it for me! Hopefully your tailor can take the sleeves off like you said! Oh no! So sad to hear about your shirt! First thank you for your comment on my blog it was my best medicine its wonderful to have friends all around the world. Second you look like a succeful business lady with or without a cardigan but i love the red one. You bag is your statement accessory. You are lovely in both looks. Thanks Marisa. I hope you are feeling better soon! Nosotros estamos entrando en verano aquí pero aun no se nota mucho por que sigue lloviendo. Me encanta el estilo del cardigan asimétrico y te sientan genial los dos colores. Un besito guapa. These are great cardigans Mica! And as you know I do love that drape/button detail. Is this the first time I've seen the Bayswater have an outing... or maybe I just haven't noticed it. It's a great bag! As for the Zara shirt with the sleeve snafu, hopefully the tailor can make it into a tank, I've done the same before with the iron! I haven't used it in a while - it's an office only bag for me at the moment and it goes a while between wears sometimes! I love the red cardigan! They're both great colors and shapes - the button on each side is such a great feature! That stinks you might have to get rid of the star shirt. Hopefully the tailor can fix the burn mark. A red cardigan is a must have in my color. It such a fun and classic pop of color. Have a great week. Yes, I hope I can get it fixed! The red one! That is the perfect color for me! And so sorry to hear about your shirt, these things tend to happen when we are in a hirry. Which I suppose we always are with little kids and a job. I hope you'll be aböe to get it transformed into a tank. haha yes, constantly busy and not always thinking things through! I'm hopeful I can get it transformed, we will see. 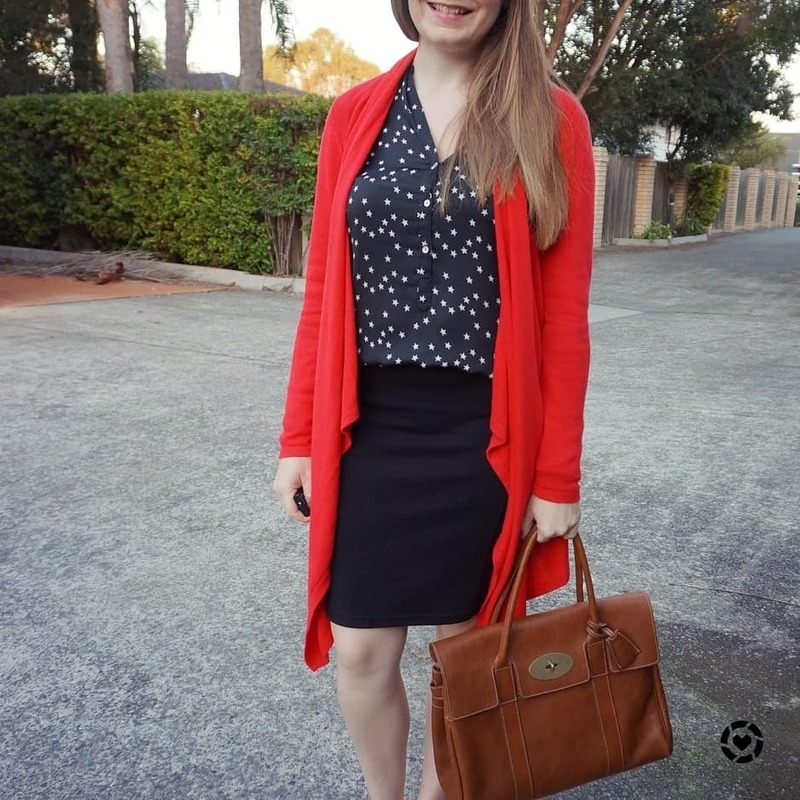 I love the way a cardigan can add a bright pop of color! Hope you're having a great week so far, babe! Thanks for sharing your experiences. Renovating can be so hard when you're living in the house you're renovating. Any kind of work around the house can be very time demanding, but when you're happy with the home you live in, it makes it all worth while. Have a lovely week ahead. PS I hope you were able to save the shirt. Haven't found a tailor yet as my go-to has retired! I recommend the bayswater, they are a nice bag! Absolutely adore the burst of colour with the fist cardigan, it really makes the whole look pop! Adore the bag also, I used to have one quite similar and loved it until it broke - maybe I should give this brand a go? 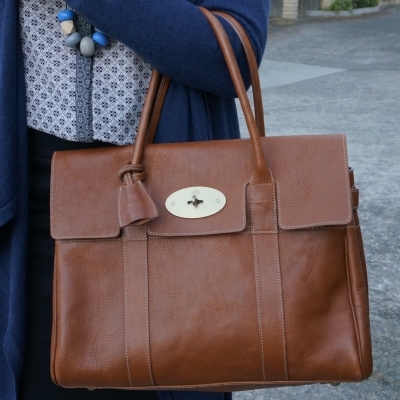 Mulberry are highly regarded as a high quality brand, so worth giving them a go I think! Oh yes to picking them in two colours. I do the same when I find something that I love. -But the red is my favourite because it my fav colour. Ha!! You look office ready in these outfits and so beautiful. Ah loving the looks and the bag is beautiful! Loving the vibe and style of the outfit, effortless! Love your cognac bag Mica, its such a classic shape and goes with everything !Pretty star top, on you and i love the color red on you! Great look! Hope you are enjoying the week. I think you know which cardi is my favourite! The red, of course! I can't believe you burned through a blouse from ironing it!! I know, such a silly mistake to make! loving the red, so striking. Don't forget to come link up over at A Labour of Fashion my Thursday Link up. Really pretty outfits! The bag is a great classic, of course. Beautiful bag and outfit! We have no Mulberry near us by I've stopped in the NYC store before. Such lovely things!